Today was the small local market. The only vegetables I can get there are the winter growing ones. Things like cabbage, kale, leeks, radicchio, some lettuces, Brussels sprouts. Also an odd thing called Gobbi. Also known as cardoni and cardi in Italian. And cardoons in English. So far I have not bought any but, since it’s seasonal and kind of special I will the next time I see it. I have found a recipe and how to trim it. 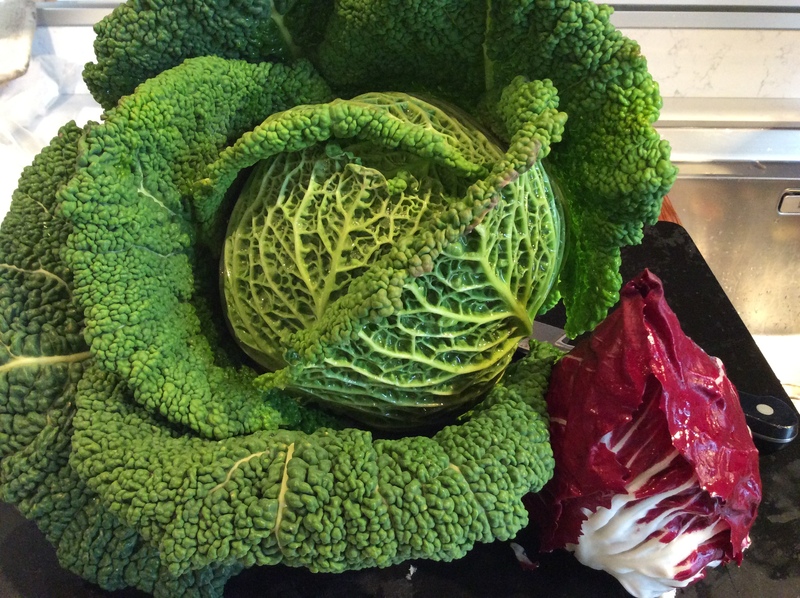 I did buy some very pretty cabbage and radicchio for my planned minestrone soup. Here is a picture. Did you know minestra means soup and if you add -one to an Italian noun it means it’s a big one? 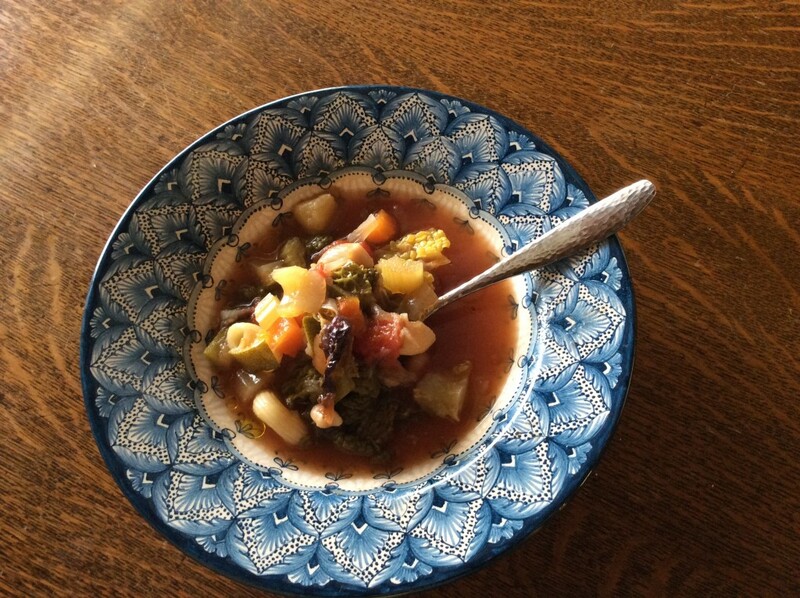 Thus minestrone is “big soup”. I made a pot today. I had bones I saved from a chicken so I made a nice stock. Into that I put onion, celery and carrot, the traditional oduri in Italy. Then a can of tomatoes, a potato, a zucchini, pinch of pepperoncino flakes, chopped radicchio and cabbage and simmered for about an hour. I added a can of cannolini beans and some little pasta. Then I cooked it a bit more until the pasta was done. Served with a drizzle of good Umbrian olive oil. Yum! So healthy and warming. 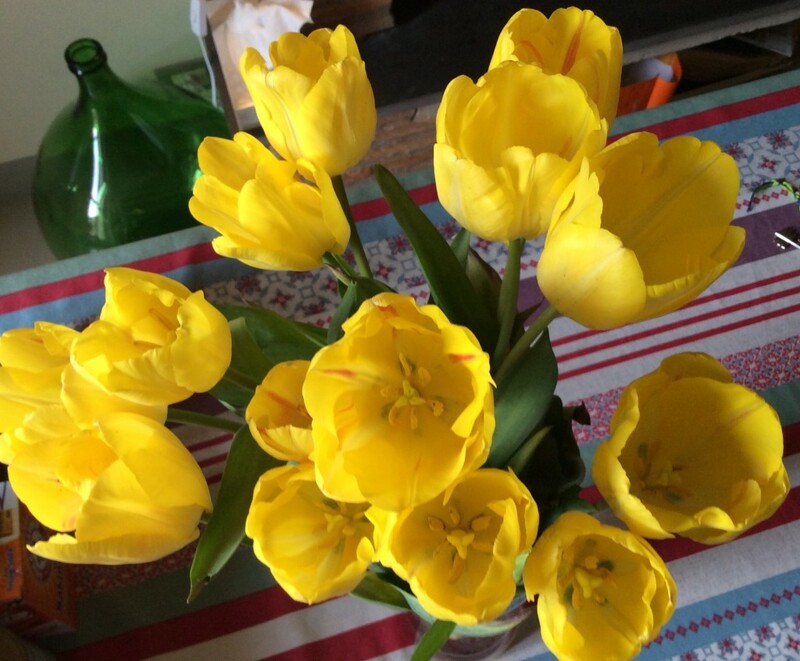 To remind myself that spring is not TOO far away I bought a bouquet of yellow tulips to cheer my kitchen! This entry was posted in cooking, Eating, everyday life in Umbria, Uncategorized on January 31, 2016 by Nancy Hampton. 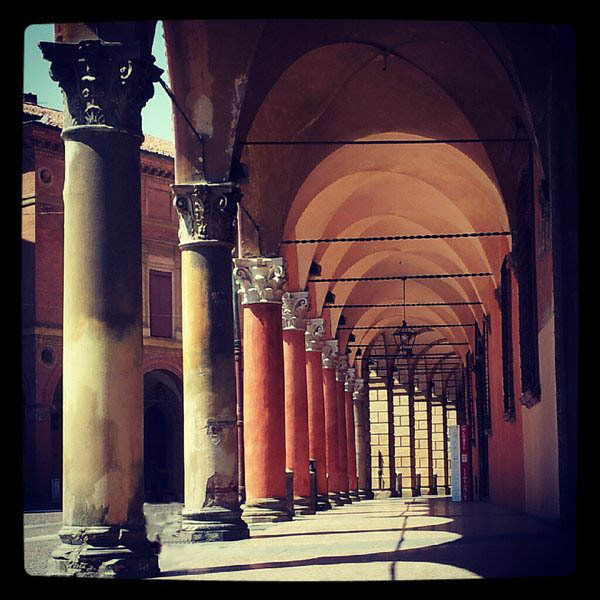 We decided to do a quick overnight trip to one the cities we once visited for a day – Bologna. 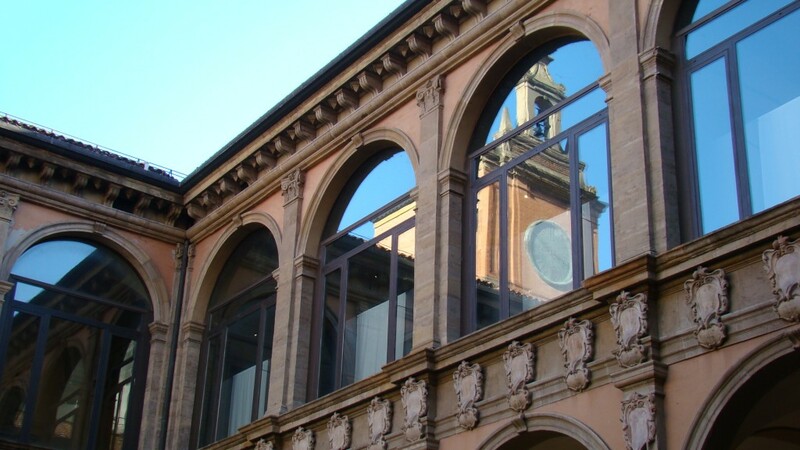 It is called Bologna la grassa, or Bologna the fat because it is said the best food in Italy can be found there. 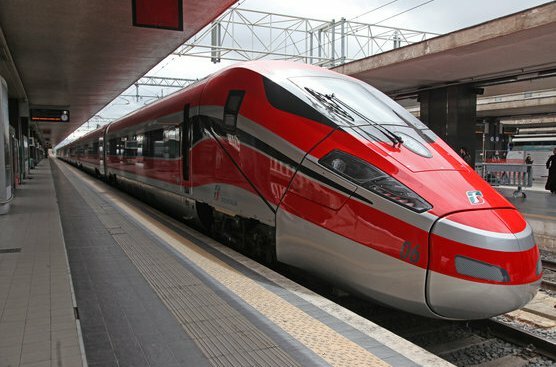 We took the local train from Terontola to Florence and changed to the Frecciarossa or “Red Arrow” train. It took only half an hour to get from Florence to Bologna on the fast and super comfortable train. Complementary newspapers, snacks and drinks were served. It is very like business class on a plane. 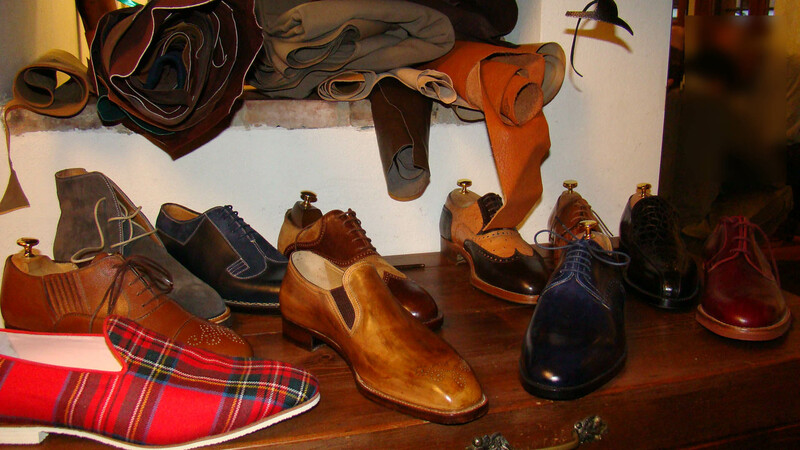 In fact there are three different classes to choose from – Business, Premium and Standard. Here is a photo from TrenItalia. The weather was surprisingly beautiful. Bright blue skies and moderate temperatures. Here are a few pictures I took. The Christmas decorations were still up. This mall was full of the very high-end shops. AND the January sales are on! 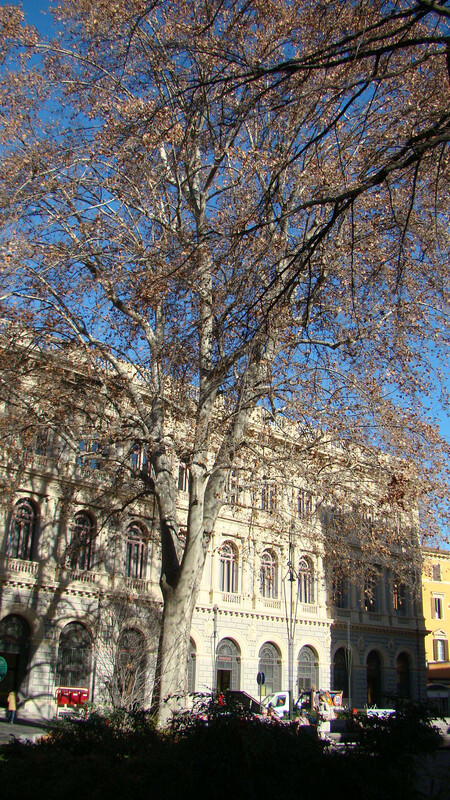 Square with pretty architecture and trees. The city has some of the prettiest architecture. It was not bombed in the war so it is intact. One of the endearing features of this city are the 37 kilometers of covered arcades. 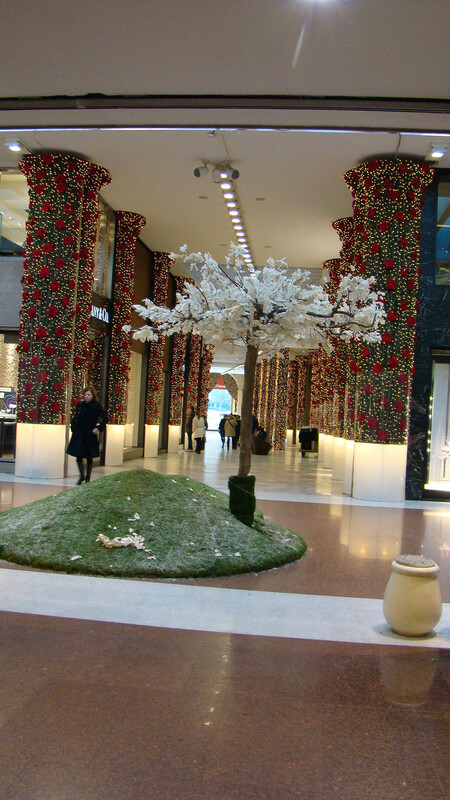 Beautiful arches and columns allow you to shop and walk quasi indoors. Nice when it rains. So pretty to see. They are all different. 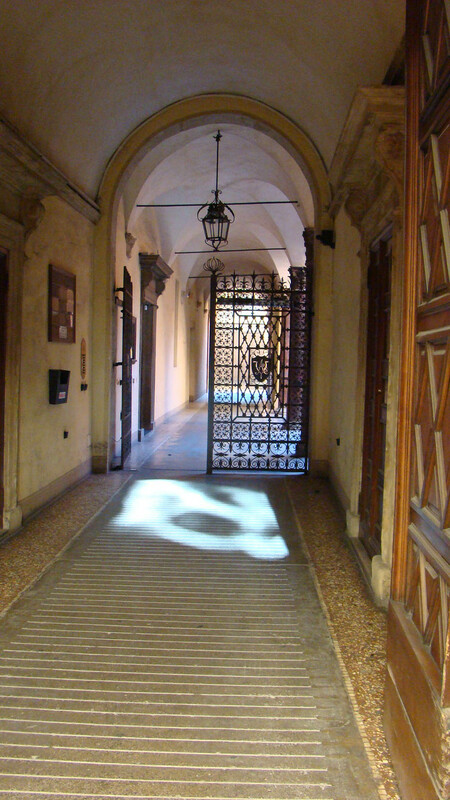 Bologna has the oldest university in Europe, over 1,000 years old. The city is full of young people who bring their energy to the vibe. It also has a warren of tiny streets with nothing but food. Food of every sort. A feast for the eyes and the stomach. I am surprised the city is not more of a tourist draw given all that I’ve seen there. Speaking of food… We just had the one night so we opted for Trattoria Serghie. It was written up in Gambero Rosso and Osterie e Locande d’Italia. We booked because it is a very small place. I counted space for 22 diners. Surprisingly they had no Antipasti, just primi, secundi and dolce. That was fine. We really enjoyed the food. the Stinco di maiale was the best we’ve tasted. I also had the tagliatelle with bolognese sauce…what else! This entry was posted in Eating, restaurants, Travel, Trip Report on January 19, 2016 by Nancy Hampton. Oh sure, some of the big box stores are open on Sunday just like in the US. But the smaller places like banks, businesses, family owned places close on Sunday. It is a day for families to get together for a big lunch. Either at home or in a restaurant. Speaking of restaurants, since they are usually open on Sunday for the big Pranzo, they choose another day of the week to be closed. Monday is a popular closed day but it could be any day of the week. They do this throughout Europe. In Germany it is called ruhetag or day of rest. There is no equivalent word in Italian. It usually catches Americans by surprise so be sure to check that your restaurant of choice is open the day you want to go! This entry was posted in everyday life in Umbria, Uncategorized on January 17, 2016 by Nancy Hampton. Househunters International comes to Umbertide! Just before Christmas Househunters International came to town to film Joseph and Paul, our neighbors across the Piazza. Luther and I had applied also but they rightly picked them. They are tremendous Umbertide boosters and were very proactive in showing the town in the best possible light. I found the whole process very interesting to watch. They spent 5 days filming around 10 hours a day. They did a lot of B-roll filming of them walking along our little river path, through the pretty arches and visiting the Saturday Kilo-0 market. Then they filmed in their art gallery, Gallery Grefti, and in the local Jazz club. They, of course, saw three houses, one of which was theirs. The show producers wanted to have a moving company come and empty all of their belongings and furniture from their present apartment and put it all back! But Joseph and Paul objected. They had an alternative which was to see the apartment beneath them which has been vacant for years and was similar to theirs. I enjoyed watching them film and even got filmed with Joseph in the Gallery. If we hear from the HHI people telling us of the air date for the show I will be sure to post that here on the blog. We cannot see the show here so I hope they will send DVDs. Then, at the Kilo-0 market we again saw cameras. “what the? ?” we said. Well they were filming a TV show shoot in one of the stands. Cameras, lights, sound equipment, police! My my, Umbertide is getting a LOT of press lately! 🙂 turns out it was a show that takes place in Gubbio normally. 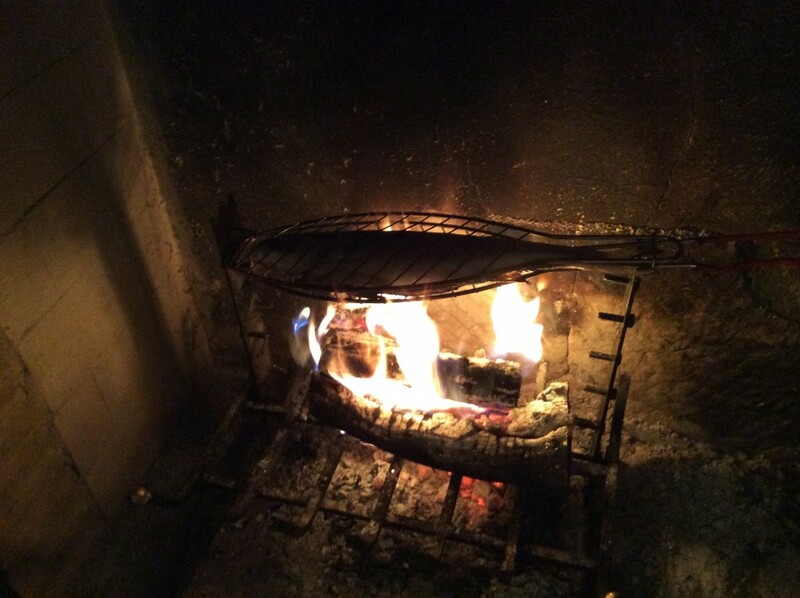 This entry was posted in everyday life in Umbria, House Hunting, Umbertide, Uncategorized on January 11, 2016 by Nancy Hampton. I have been busy what with the trip back to the US and other holiday type things. I felt the need to do a little catching up. Our trip back home was nice. It was great to see my Sister and spend the holidays, not to mention two significant birthdays (hers and mine) together. We stayed with her on top of her mountain in the Blue Ridge of Virginia. It is beautiful there. We had warm weather and lots of fog. More likely cloud as in we were up in them at 3,700 feet. She fixed many of my favorite things to eat to include a gorgeous standing rib roast and chili as well as several southwestern and Mexican things. These were all things I had missed in Italy so it was great. I was sad to leave after six days. We had gone to the US with two ginormous suitcases. One was mostly packed with Umbrian specialties like olive oil, lentils, faro etc to give away as gifts to friends. Then we did some shopping for things we cannot get (or are hard to find) in Italy to fill up the, now empty, suitcase. Mostly things like heavy duty aluminum foil (they have very flimsy foil here), ziplock bags, medicines and spices. Carolina rice is a special rice we like so we stocked up on that and pozole for southwest recipes. We also got some things for friends. And I bought some new clothes. A lot of it I had ordered online in advance and had them sent to my sister. During the trip we had time to catch up with many friends and family. We got to see all my nieces and nephew at a lovely Christmas dinner in Old Town. I also got to meet Alex, Niece Rachel’s boyfriend, and congratulate my nephew on his recent engagement. Lovely family. Thanks to Mike and Anne (Luther’s brother and his wife) for a lovely dinner! 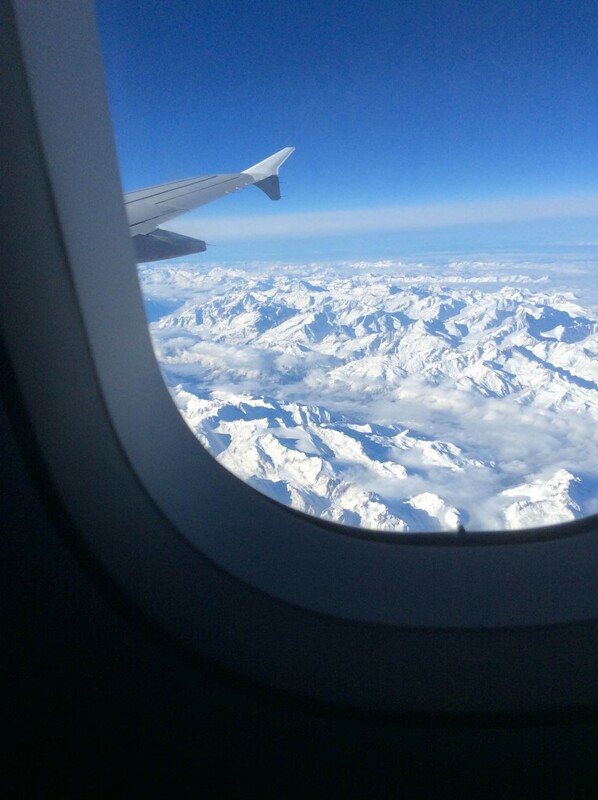 We had a beautiful view of the Alps on the way from Germany to Rome. Much more snow on the way back than on the way over to the US. We’ve been back for six days now and our jet lag is mostly over. The logistics of the trip worked fine. The air tickets were half the cost of tickets coming from and returning-to the US. I have NO idea why this would be but it was good for us. The car park in Fiumicino turned out to be great. Very efficient and quite cheap; only 38 Euro for 13 days and included the shuttle to and from the airport. A very easy and convenient way to use the Rome airport. Our weather has settled into the typical cold and damp winter. The final days of the Christmas season were this week with Befana, the witch, visiting the children to bring candy or lumps of coal. We celebrated with a lovely lunch at Calagrana. There were about 14 people there. And finally, last night I decided to try cooking on our kitchen fireplace. I am slowly getting the hang of using this fireplace. It takes a while for it to warm up enough to draw well so I keep the glass doors closed for the first couple of hours. Then I slowly can open them and use the fire to cook on. Last night it was Spigola or Sea Bass. Easy to do and it came out crispy and fluffy white inside. Future plans will be grilled vegetables, steak, lamb, other fishes and bruschetta. Maybe even flat breads. I am on the lookout for an iron pot. Buon Anno to all! I hope it is a Happy and Healthy 2016! This entry was posted in cooking, Eating, everyday life in Umbria, Travel, Uncategorized on January 9, 2016 by Nancy Hampton.